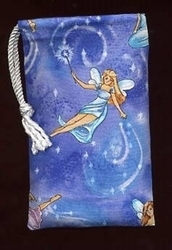 With soft pastel shades of lavender, rose, moss, and cream you'll love this Flittering Fey bag! Elegant, wand-bearing fairies go about their day, spreading magic among the flowers and foliage. 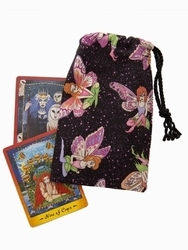 This tarot bag filled with fey-folk is the perfect place for your fairy-themed tarot cards! 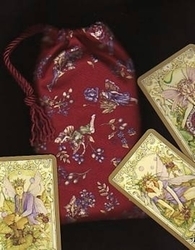 Deck suggestions: You can see from the picture that this bag looks stunning with the Mystic Faerie Tarot but also looks great with the Faerie Guidance Oracle, the Victorian Fairy Tarot, or even the Crystal Visions Tarot. 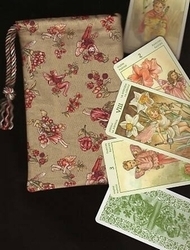 Size: Measures approx 4-1/2" by 7-3/4" to 8" inches (about 11 cm x 20 cm). 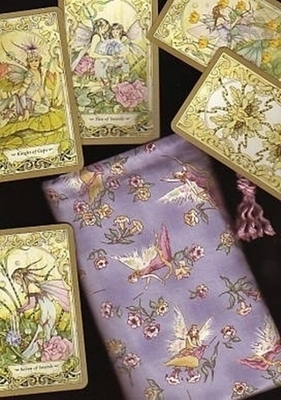 Fits most standard tarot card decks (3" x 5" or smaller).